Which MAXIM  Electric Fence Energizer Do You Need? Choosing the MAXIM electric fence charger (fence controller) with the power for your application is simple. Add together the lengths and types of fence that eventually need to be operated* on one fence energizer (fence charger) and refer to the guide below or to the label. The first number of the model name is the length of cattle fence overgrown with vegetation for which each charger is rated (see note below "Maxim Guide"). The second number is the length of clean well insulated wire and both are in miles (1 mile = 1.6 km). The length of overgrown sheep fence, goat fence, hog fence, and wildlife fence is also listed. It makes choosing fence energizers much easier. The first number is also the approximate number of ground rods needed for maximum performance. * "operate" means to maintain 1500 to 2500v on dry cattle fence and 2000 to 3000v on 1/3 as much dry sheep, hog, or wildlife fence in areas with about 40 inches (100 cm) annual rainfall and without ground wires; "wire" means 14 1/2 gage (1.6 mm) or larger. * "Guaranteed To Go The Distance" means a charger will perform as specified herein, if the charger is installed correctly, or the energizer will be replaced or it's sale price will be refunded by the seller upon its return. 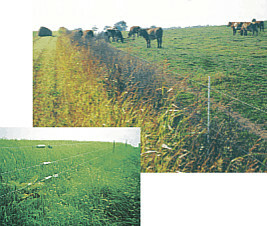 In the guide, "cattle fence" means up to three hot wires on insulated posts with the bottom wire 15 inches (38 cm) or more off the ground and other wires not grounded. For other fences with low hot wires (5 to 10 inches or 12 to 25 cm), less than half as much fence can be operated on the same charger. It is best to choose a more powerful energizer if there is old fence wire trash nearby or "ground wires" in the fences which reduce the length of fence that can be operated. The M 2-20 is for small to medium size applications with lighter vegetation loads. The M 2-20 will even power short lengths of sheep, goat, hog, or wildlife fence. The M 3-30 is popular for many high power uses but with the lower cost of medium power chargers. It will operate long lengths of cattle or horse fence in vegetation and moderate lengths of sheep, goat, and wildlife fence. The M 5-50 is a high capacity energizer for long overgrown fences. It exceeds the output of other high power chargers and is useful for sheep, goat, hog, wildlife, & predator fences. C105 M 5-50: $299.00 The M 9-90 is the maximum power energizer for use on larger farms and longer fences with heavier vegetation loads in higher rainfall areas. It has the lowest cost per mile of fence. Output on "Half Power" is like most high power chargers. 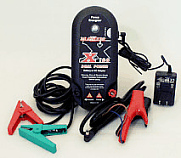 The Dual X100 and X150 are unique and compact electric fence energizers that can be operated with a 12 volt battery or plugged in to a 110 volt receptacle or extension cord. They will power five to seven electric fence nets with average vegetation loads, seven to ten electric nets with no vegetation, and up to about 10 or 15 miles of well insulated wire or nearly one to one and a half miles of overgrown fence for horses or cattle (and up to one third to one half mile of overgrown fence for sheep & goats). These fence chargers can be hung on a post or wall, come with portable fence and ground rod leads and 12 volt battery leads, all with alligator clips, and with a 110 volt plug-in adaptor. The X100 and X150 have a two year warranty, including lightning damage. The Mini Max is a very compact "low impedance" 110 volt unit that will power two FAST FENCE Nets with average vegetation load or up to four electric nets with no vegetation load. The new unit terminals are wing-nut style that accommodate plain wire or ring connector leads. The unit has replaceable fuses and a regular one year warranty. The DVM Digital Voltmeter reads up to 9.9kv (9900 volts) and is helpful for testing and troubleshooting electric fence that is electrified by a modern pulsing type energizer. The display will show kilovolts, which is thousands of volts. The Lightning Arrestor Kit helps protect energizers from damage due to lightning strikes on or near electric fence. They are stronger than porcelain products, not affected by moisture leaks, and come with a heavy duty ground clamp. All MAXIM brand fence energizers (chargers & controllers) are made in America ( except the B 6 Portable and Dual X100 which are made in England) and use modern digital power technology with a special integrated circuit chip to develop and control the pulse. Instead of the conventional analog type voltage doublers with rows of capacitors, MAXIM fence chargers switch alternating current off and on many many times per second through a transformer. Less heat is produced, fewer components are needed, and more exact control is possible. All this leads to more power, lower cost, and longer life. In addition, MAXIM high voltage output transformers are designed to provide the maximum power on the fence when it is needed, that is, at heavy load conditions. That's why MAXIM fence energizers operate long lengths of fence with heavy vegetation loads and still shock with enough power. The MAXIM line-operated plug-in fencers (except the X100) are equipped with a safety shutdown feature to control overpulsing and with an automatic reset circuit to restart the energizer. The safety feature is intended to stop operation if the charger should begin to pulse very rapidly. Some "high frequency" interference such as large sparks and lightning, especially on high voltage power lines, can also trigger the shutdown feature. Unlike non-digital control fence chargers, the MAXIM shutdown is automatically reset by a special circuit built into the energizers so they require less service and have less downtime. Best of all MAXIM fence energizers just cost less, a lot less. Tests conducted at the facilities of major agricultural universities in the United States have shown that the cost per mile of overgrown fence that can be operated on each unit is much lower, in fact, 20 to 50 percent lower, depending on energizer brand and charger model. Thirty years of electric fence experience with American conditions and American high powered electric fence styles have produced a base of fencing knowledge and expert advice for the best customer service. MAXIM fence energizers are backed by a two or three year warranty that even includes lightning damage. Best of all, they are backed by a company and authorized dealers across the country that have provided prompt dependable service since 1978. Energizers are normally repaired in one business day.